Happy New Year to you and your kids from Hines Little Smiles! Our family of pediatric dentists and staff look forward to serving you in the coming year. 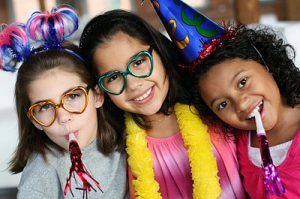 With each New Year, your child’s smile is dependent on a consistent preventive routine. Here are some ways you can help your kids have a healthy and happy smile in the coming months. If you haven’t yet, now is always a good time to begin teaching your kids the habits of a healthy smile. Not only will it help them maintain good dental health, but allow them to get into the habit of preventive dental care as they grow older. First, brush twice a day. With smaller children still developing motor skills, you will need to assist them with this or even demonstrate. Children usually need help until about 6-7 years old. A toothbrush appropriate to their age is used to remove bits of food that may have become lodged between teeth. Brushing will also help loosen and remove plaque and tartar buildup. Be sure that your child is brushing in the morning and the evening before going to bed using light circular motions. Spend two minutes brushing, with particular attention on the back molars. Replace the toothbrush every 3-4 months or when it starts to show signs of wear. You should start flossing your child’s teeth once per day between the ages of 2-6, or as soon as their teeth start fitting together. Even when they still have their primary teeth, flossing is vital to keeping cavities at bay. Certain candies and foods are particularly harmful to teeth. Sticky or chewy candies can rip out fillings. Hard candies can create problems because they keep sugar in the mouth for a long time. Sour candies can also be harmful because of the large amount of acid they contain, which can wear down tooth enamel. Sugary drinks like sodas and fruit juices are loaded with sugars and can cause tooth decay. If your child does consume any of these things (which they are certainly likely to do!) don’t fret. Daily brushing and flossing will help remove the sugar and acid buildup. But remember, moderation is key. Bi annual dental office visits play an important role in keeping teeth healthy. Not only do they give the dentist and hygienist a chance to clean and polish the teeth, they can also give your dentist a heads up if there are any potential problems. To get your kid’s dental health on track this year, reach out to our pediatric dental practice in Columbus, OH. To arrange a dental visit and cleaning, call us at (614) 423-6857 or schedule an appointment here. We look forward to partnering with you to give your child the best dental care possible. From your friends at Hines Little Smiles, may you have a joyous start to the New Year!